It’s no secret: the brutal part of the human nature and its readiness to bring a harm to another being. But what we did not know is that back in 1961, famed social psychologist, Stanley Milgram conducted an extreme behavior experiment on ordinary human beings and their willingness to obey authority. And one of the main reasons Dr. Milgram begins his test is to study the reaction of human beings to see how far they can go with obeying orders despite their dangerous actions that can kill the other participants. And should we be surprised that most of them fail the test? I guess, in this case, a big surprise would be if they would have passed it…. 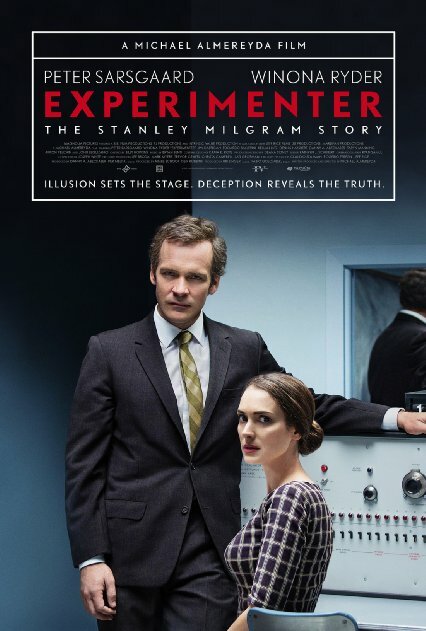 Experimenter begins in 1961, at Yale University, where Dr. Williams (John Palladino) happily welcomes the first two participants, who have no idea what lies ahead in the next few minutes. Young doctor quickly explains that James Wallace takes the role of a teacher while James McDonough (Jim Gaffigan) is a learner. The test is about asking questions. And if ‘the learner’ gives a wrong answer, ‘the teacher’ should not only administer an electric shock and ignore the plea of ‘the learner’, but also increase the volt up to 400 until ‘the learner’ learns to answer the questions correctly. And of course, in order to successfully pass the experiment, the teacher goes up till the maximum without even knowing that it’s him and his reaction is all what is being tested…. As the film progresses, you find multiple participants who successfully ignore the plea of ‘the learner’ to stop sending an electric shock and his desire to stop the experiment. However, the order that comes from Dr. Williams is to not stop the experiment at any cost is quite convincing for ‘the teacher’ to continue asking the questions and increasing the volt up to maximum. It’s fascinating seeing only one person who refuses to obey the order and stops administering an electric shock due to his fear that can accidentally bring harm to another person. And unfortunately, this will be the only case that will amaze you and make you happy that there was at least one person who was smart enough to stop the experiment despite everything, while the rest of them would have successfully killed the participant if the electric shock they sent each time would have been real…. Peter Sarsgaard is one of those actors whose films I watch with high anticipation. And Experimenter proves once again how excellent and gifted Sarsgaard is. He captures Milgram’s intention, his idea and determination to study human behavior so well, that sometimes it’s really scary even watching him. The scenes where he sits with cold-blooded face asking ‘the teacher’ after failing the test the reason why he did not want to stop the test after hearing a cry is something that would make you wish to shut your ears and not hear the answer. Obeying or disobeying is a never ending reaction humans can produce. But what you will learn is after watching Michael Almereyda’s film is that there is no way we can stop the brutality in society, but can predict the amount of people who live in a big jungle, called the city, where they are ready any time to release the anger and do anything possible to obey the order. This film is certainly not for everyone, but only for those with strong nerves who can handle the reality the way it was proven in so many ways and no longer surprising seeing that human behavior has not changed since 1961, and probably, will never change.